It is only when darkness rolls in will Amoy Street be the most awake. From off-the-clock jaded urbanites with loosened ties to glamazons tittering in their nine-inch heels, the cool street is commonly known for being a sanctuary of good food and potent nightcaps for all kinds of night creatures. The culinary allure of Amoy Street is easily attributed to its extensive lineup of charming eateries, reeling in hungry patrons with diverse dining options such as the likes of modern Southeast Asian delights from Ding Dong, elevated Sichuan dishes offered At Birds Of A Feather and Moosehead‘s take on street food from all around the world. Unbeknownst to most, there’s literally a quieter side of Amoy Street with Gemmill Lane – a reticent back alley that sits behind the rambunctious street. The stretch doubles up as space for a handful of restaurants, hiding in plain sight by swapping gleaming storefronts for non-descript doors. Having had a lovely experience at one of the lowkey players Maggie’s Joan, we wondered if French-Japanese restaurant Le Binchotan would fare the same. Adopting the same elusiveness as reflected by the entrants along Gemmill Lane, Le Binchotan is easily overlooked, if not for a blink-and-you’ll-miss-it signboard that points you to its entrance of simple glass-panelled doors. 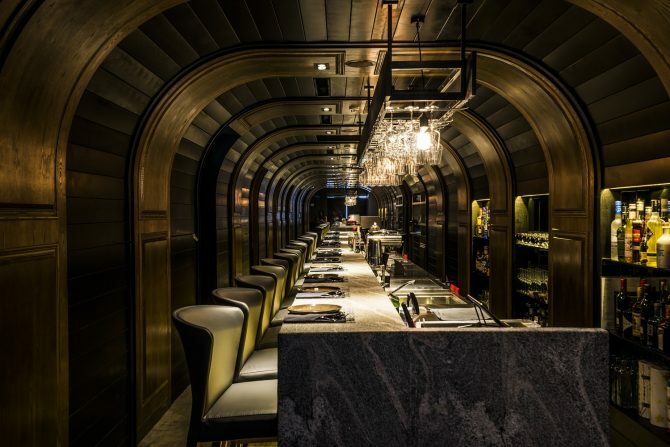 Inside, the restaurant impresses with a chic bunker-esque interior, bedecked with masculine accents of wooden frillings and an impressively long bar counter made of stone. Simply put, the fusion restaurant is a very much like a stylish bomb shelter. Like its name suggests, Le Binchotan gels the gastronomic cuisines of both French and Japanese, with the latter’s age-old cooking technique of grilling over Japanese ‘binchotan’ coal is at the heart. So expect to find the grilling technique very much present in its dishes, either unabashedly obvious, shown in its yakitori offerings, or subtle as illustrated by the Uni & Caviar ($25), featuring a base of velvet-like corn mousse, where the golden cob is first binchotan-grilled and cooked in bacon broth. 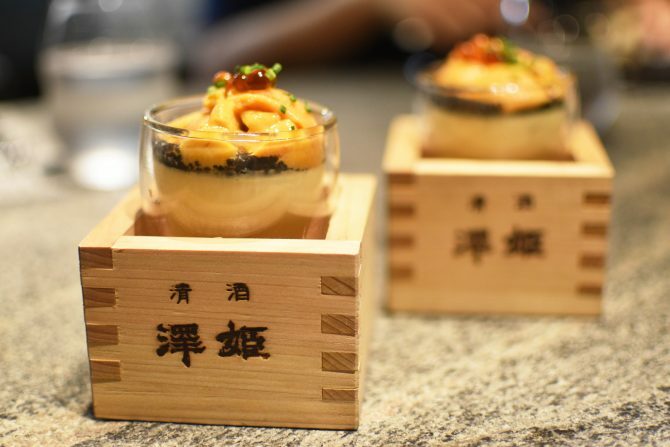 Harmoniously complex, the multi-dimensional uni starter of flavours and textures is then layered with caviar and a gentle hill of uni, while housemade shoyu pearls top it off. For something more distinctive binchotan-grilled, look to the Binchotan Burnt Aubergine ($12), featuring the fleshy fruit deskinned and burnt on binchotan before served chilled with a creamy dressing made with yoghurt, white sesame seeds, sesame oil and a dash of Japanese chilli oil (la-yu). The garnish of deep-fried wild rice grains gives the dish a welcome crunch. After our bellies were warmed by sake-spiked broth of Little Neck Clams ($20) and enoki, we were presented with blackened logs of Edible Charcoal ($23). 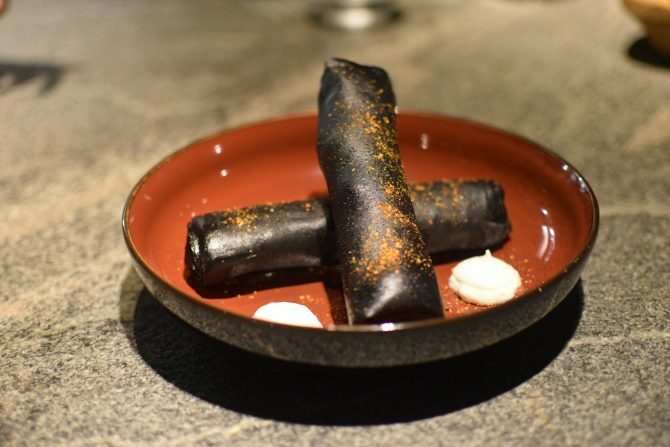 While not literal charcoal pieces, the tongue-in-cheek dish is actually a spring roll of sorts, where popiah skins, infused with bamboo charcoal powder, roll up slow-braised angus short ribs before deep-fried. Looking to carbo-load? Then order the Sakura Ebi Capellini ($27), a pasta dish drenched in olive oil that had sakura ebi sauteed in, before more skaura ebi and lashings of shio kombu are added in the mix. 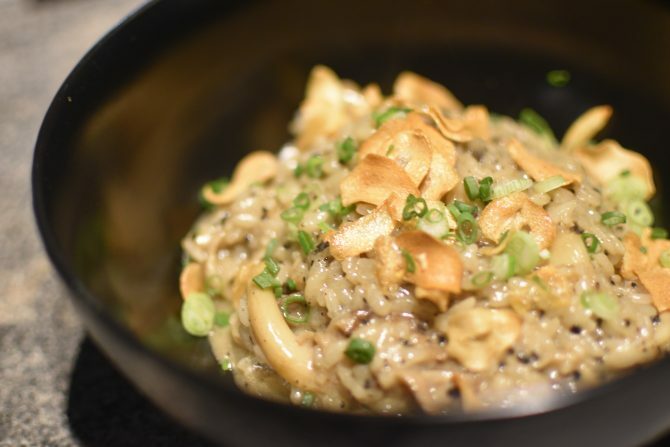 Also a strong contender in the carbs arena, Mushroom Risotto ($29) is chockfull with enoki and shimeiji mushrooms and the truffle jus and paste. While deliciously creamy, the risotto is devoid of any sorts of cream and instead, thanks to culinary science, the natural release of starch from the rice allows for the creamy consistency. Rounding things up on a sweet note comes the Matcha Lover ($17). Moulded into an adorable apple, the dessert’s is of white chocolate, elevated with matcha powder, before served with red bean ice cream and crushed feuilletine. Now, that sweet treat is certainly the apple of our eye.